To properly manage your forest, tree cutting is a fact of life. Eventually, it has to be done. As the forest canopy grows and new growth emerges underneath, trees begin to compete for essential resources like sun and rain water. In a densely-populated forest, you’ll want to decide which trees should be harvested so others can grow. In some cases, you may even need to start from scratch by clear cutting. We’ve created this guide to help you decide. Clear cutting is when a logger comes in and completely clears all the trees off a property. While the outcome is a barren, unattractive wasteland, sometimes wiping the slate clean is the only way to create a blank canvas for reforesting, pastureland or other uses the landowner has in mind for their property. In addition to clearing out undergrowth and brush, clear cutting allows the forest manager to deliberately replant only the species of trees he or she wants in the areas he or she wants. It is also an effective way to create new wildlife habitats. Newly clear cut forests are great for attracting quail, turkey and other insect-eating animals. Because you’ve cleared out the canopy, the ground vegetation can now grow, which is attractive for bear and deer. Another consideration for clear cutting vs selective tree cutting is the financial investment. Money is a major motivation when people choose to clear cut. With selective cutting, the property owner pays a company (like us), to cut the trees for them. In clear cutting, the logger pays the homeowner a percentage of the timber sale and pockets the rest. We get it — we’d rather get money than spend it, too! Many property owners think of it as a “quick buck” — they’ll clear cut, plant and harvest later for more money. Actually, that “quick” buck, is more like 30-50 years! That’s how long it takes to replant and regrow timber to a level where it can be harvested and sold again. What is Selective Tree Cutting? As the name suggests, selective tree cutting is selecting specific trees and removing them for timber. These can be diseased or unhealthy trees or simply trees so large they are choking out the smaller ones. The goal is to remove enough canopy to allow sunlight to reach ground level. There are a few selective cut variations. One is to remove a consistent and even number of trees, allowing for adequate space between each one. Another way is to selective cut strips of trees to thin out the forest. There are variations on this last type which will allow you to convert even-aged groves to uneven-aged ones. By removing only specific trees, you’re simultaneously removing the hindrances to growth of the smaller trees and encouraging wildlife habitats. Since you are leaving behind other trees to grow to maturity, you don’t have to wait 30-50 years to harvest again. Your smaller trees will grow faster and be ready to harvest sooner than if you hadn’t thinned out your forest. Due to our business model, we prefer selective cutting because after we cut your trees, we can turn them into lumber then build you something from that lumber (or if you’re a dyi person, leaving the lumber for you). As woodworkers, we have special appreciation for cherry, walnut, poplar, ambrosia maple and all that other stuff tree guys cut into firewood or haul to the chip mill. 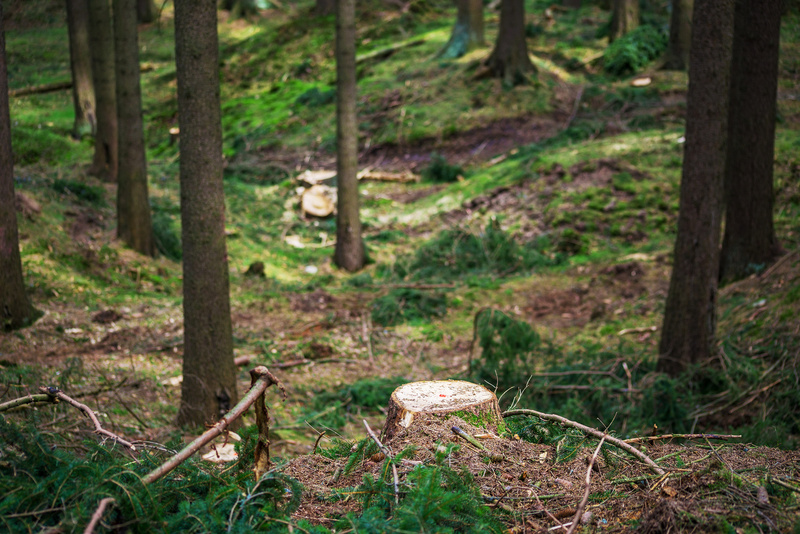 If you’re still on the fence about whether to clear cut or selective cut, give us a call. We’d be glad to discuss the options available for the types of trees you have. You can also read what the North Carolina Forestry Service suggests on their website.